As a ServiceM8 partner, Innovatus Group can work with you to streamline your job management, quoting and invoicing. 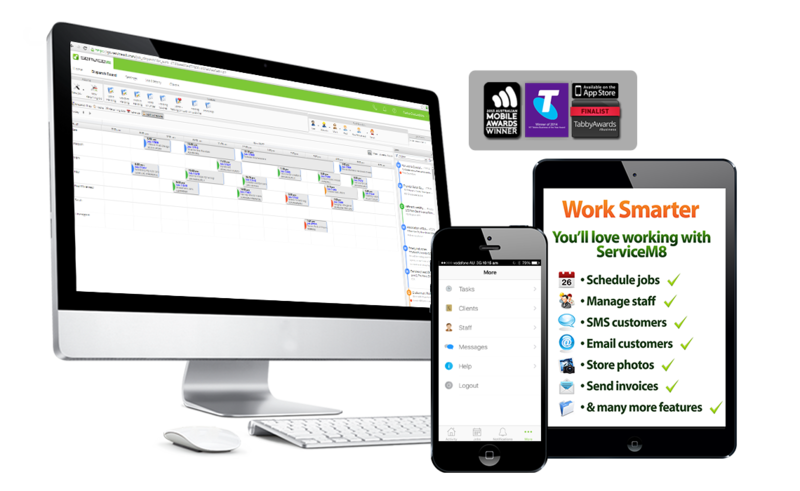 ServiceM8 is a cloud-based system designed to make it easy to book jobs and schedule them to field workers and streamline back-office processing tasks. Staff in the field are instantly notified when new jobs have been assigned to them. As staff complete their jobs in the field, the award winning Mobile App allows them to record job completion notes, take photos, add tasks, and invoice your customers instantly. Back at the office, admin staff can see how a job is progressing in real-time, and once completed, jobs can be approved to your accounting system with a single mouse click, greatly reducing back-office admin time. Locate clients and staff with one click with built-in Google Maps. Use ServiceM8 as your group calendar, schedule jobs using drag-n-drop and notify field staff immediately. Never forget another job with ServiceM8 Recurring Jobs, also great for drumming up extra business. Keep customers in the loop by sending job quotes and updates via SMS or email, you can always refer back to earlier communication as everything is saved in the job diary. Quotes, work orders, invoices, route sheets and directions, ServiceM8 prints it all. Print an employees sheets for the day in a single click. Track tasks for the entire company in one location. Set tasks for groups of staff, or individuals and get notified if they’re overdue. No job is deleted, ever. Bring up any historic job in seconds using any information you have about the job. Specify your custom details with extra fields to make ServiceM8 work for you. No more random job numbers, or multiple numbers for quotes, work orders and invoices. 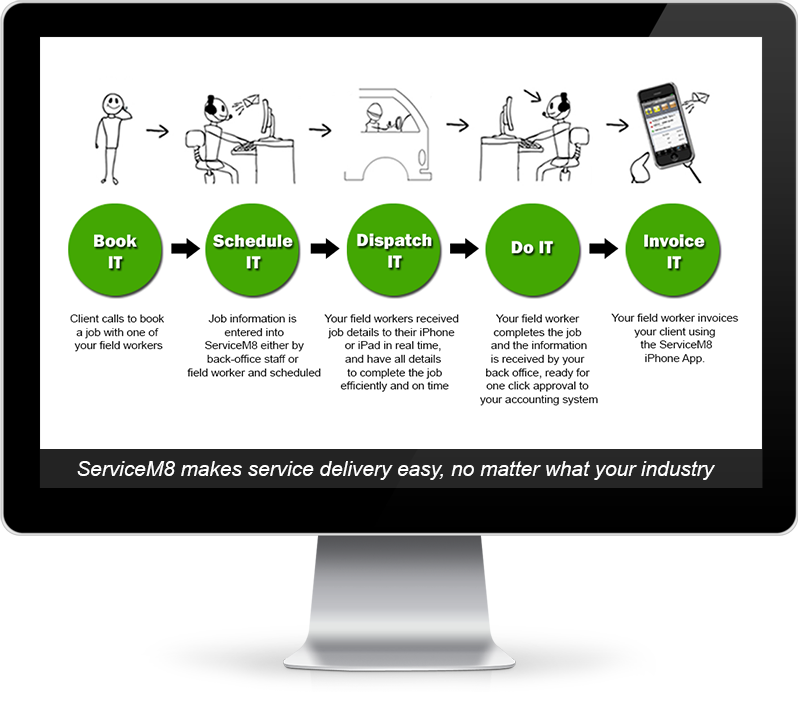 ServiceM8 issues a job number which lasts from quote through to invoice. Link MYOB, Xero and Quickbooks to ServiceM8 and sleep easy knowing an invoice is raised as soon as a job is completed, even from an iPhone. Can you guarantee every job makes it to accounts? Never miss another payment. ServiceM8 makes sure payment is received for every job you do. Quotes and Tax Invoices include GST, no american dates and storing client ABN numbers makes invoicing a breeze. No per user fees-ServiceM8 works harder the more you involve everyone in your business. Field staff, admin, accounts and managers should all have varying levels of access. You own your data – not us. So we will do everything to ensure that no-one but you (and us if you need support) will ever see it. You can download your data at any time so your not locked in. Our servers are secured with back-grade encryption, so no-one can access your data but you. See your specific schedule, jump straight to your next job and get navigate to it. Running late? Call you next appointment and let them know. Call clients in a single tap. Keep all the details for each job in an easy to read format. ServiceM8 uses iPhone Maps or Google it to navigate you to each job with the tap of a button. Produce professional quotes on your iPhone in just a few taps. Save hours of double entry by allowing ServiceM8 help with your invoicing, if you’ve already quoted a job, then your quote becomes your invoice. See available stock from you phone, add stock to quotes/invoices and access pricing on the go. Clients can sign your iPhone with a special pen, or their finger so you have a digital record of job completion. Add notes to any job to keep everyone informed, prevent incorrect communication and increase efficiency. Receive tasks directly on your iPhone and notify the office when they’re done. Take photos while at the job, and share them instantly with other field staff, or anyone back at the office. Get advise or bring people up to speed. Don’t risk storing job documents on drives where they can be lost or saved-over. Store them on ServiceM8 and access them from any PC, or even from you Iphone on the go. Call your clients directly from your iPhone contacts, you don’t even have to open our app. No job or quote is ever deleted. Find any past job in seconds using a name, an email, a phone, an address, a job or even an invoice. – ServiceM8 lets you create fast and accurate PDF invoices, so you can email them straight to your cleint, eithter from your iPad, iPhone or computer. – Invoicing in ServiceM8 is a cinch! You have access to all the sell price of all your parts and materials along with labour rates, at your fingertips. – Detailed descriptions of completed work can be easily added to your invoices. – ServiceM8 calculates the exact amount of time you spend on every job, by capturing start and finish times. Travel times can also be captured if you wish. – Client signatures, photos, notes, diagrams or even files can be attached to any job. – Invoice templates can be completely customised to look exactly how you want them to. 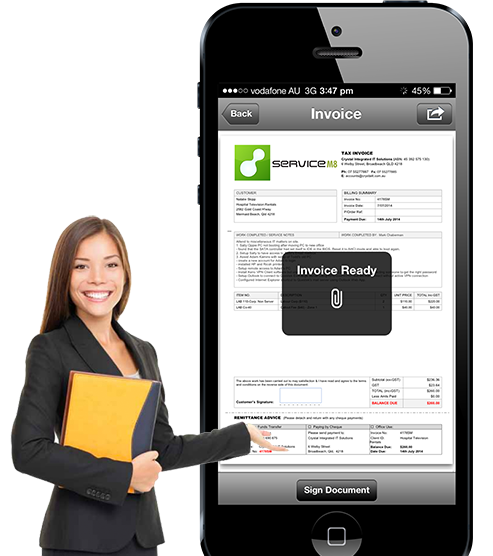 – Mobile invoicing allows you to instantly provide your clients with invoices so you get paid faster. – Progress invoices and deposits paid are both supported.